I ordered the ‘Caps Etc’ for my breakfast and asked for the english muffin to be served dry, and the roasted crimini mushrooms (HOLY YUM!) to be prepared with half the amount of cheese they’d normally use. 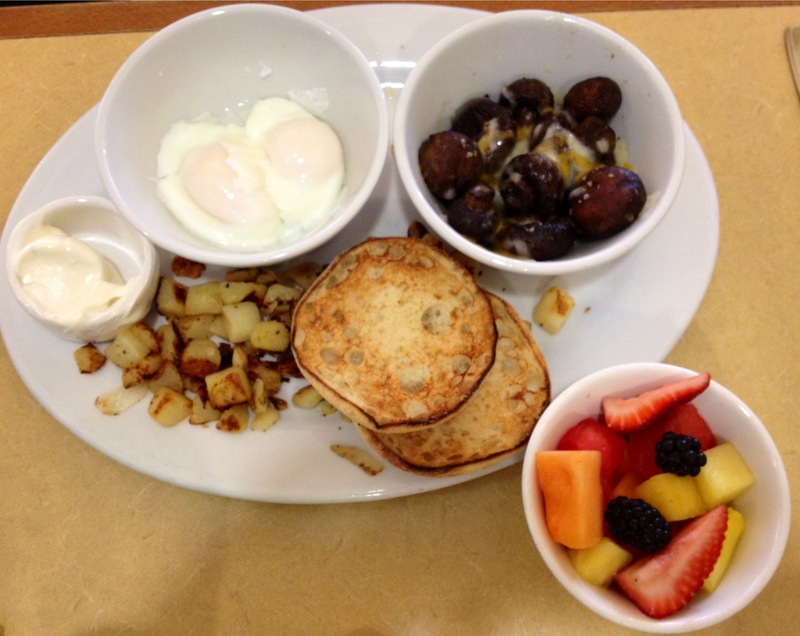 I ordered my 2 eggs poached and a small fruit salad on the side to share with my honey bunny. The food came out super fast and looking delicious. It was all exactly as I’d specified and everything tasted great. I even liked the little homefries which aren’t usually my favorite. The prices were pretty reasonable- except for the per-person coffee price of around $2.50 each. My one cup didn’t really justify that…but Gabriel did end up getting a cup to go which I guess made up for it. My entree was around $8 and the little fruit salad an extra $3.50.